After i post about my complaints on this blog, i went to bed and when i woke up this morning, the speed i gained this morning is the normal speed i usually get. It seems that they have located the problem and get it fixed. But, it's weekend and not many people go to office, so probably it was one of the reason it is faster. Also this is early in the morning, so the current speed can't be used for determining whether they have fixed the problem or not. Another good news is that W3C's Annotea Server is now back online after Ralph rebooted the machine. Thanks to Marja, Eric, and Ralph for their support for my thesis. As promised, i will give an information about seminar that are being scheduled to be held in UKDW next month. Here's the first one. For the last few days, i have become a bandwidthless with Speedy. It's speed were dropped very bad and it's not only happening on my computer, but also in other location as well. I have asked my friend who's in Jakarta and other cities in Indonesia and they feel the same problems: Speedy is no longer Speedy. Few days ago, i complaint to the 147 and they gave me an answer which didn't satisfy me, so today i called them again, and this time, they were willing to report this problem to the network division, which is better than yesterday's staff which gave instructions to restart the modem and computer and if the problem persists, please contact them again. At around 5.30 PM, i got a call from Speedy asking for the current condition. I replied that the problem still persists and i explain about my speed in the past when the connection was fine. He acknowledged that there was a problem with their connection, but it was already fixed. He will recheck the network again and check whether the problem is on the network or on the server. Anybody wants to share their thoughts here? Are you having the same problem like i do? Next month, my campus will hold two seminars, followed with another one in October and hopefully one in November (this one is for internal i guess). Most of them are open to public, so in the next following days, i will try to get the information and publish them here so that you who are interested can join the seminar. The topic for September's seminar are about License and Mobile Phones for Education, while for the upcoming seminar in October it will be Web Security. Anybody wants to share their MOTD from their computer ? Today is my first day teaching again this semester. I have in total six class in a week, but the distribution is not so good. I have to teach three class in one day (Monday), followed with one in Tuesday and two in Wednesday, leaving me empty on Thursday and Friday (well, i wanted to have Friday to be free). Teaching three class a day is a new experience for me. I never teach this much on one day. Usually i only teach two class at maximum, but now, it's three consecutive class, so i had no time to rest (Even i had to have lunch at 16.30). I started at 7.30, next is 10.30, and the last one is 13.30. Today is only the first class, but i already spend two and half hours for each class (except for the last class which was only for two hours) because i already give some introduction to the material (besides giving them the syllabus, point criteria, assignments, reference books, etc). Well, the game is now over and just like the opening ceremony, there were spectacular performance and also fireworks (they are the biggest firework producer, FYI) in the Bird Nest's Stadium in Beijing. I was kinda late a bit, plus there were lots of commercial breaks during the show, so just like the opening, i am not satisfied. The article in the official site of the 29'th Olympic Game has a nice photos about the ceremony from the beginning until the end of the ceremony, but still video are still the best media to watch the closing ceremony. Let's wait for a few days and hoping the somebody will upload the video. Thank you Beijing for the performance and thank you athletes for your dedication and efforts in this Olympic Game. We will see you again in four years in London. One more day and the Beijing 2008 Olympic Game will end. The last two day will be full of medals and of course, you don't want to miss the final battle in the basketball court where the former Dream Team is trying to redeem what they missed in the previous Olympics in Athena. Ubuntu is most popular in Italy and Cuba. OpenSUSE is most popular in Russia and the Czech Republic. Red Hat is most popular in Bangladesh and Nepal. Debian is most popular in Cuba. Cuba is in the top five (interest-wise) of three of the eight distributions in this survey. Indonesia is in the top five of four of the distributions. Russia and the Czech Republic are in the top five of five of the distributions. The United States is not in the top five of any of the distributions. Where do they get this information? What else besides Google? It may not represent the true numbers, but at least we can see some statistics from Google. Last Wednesday, i attended OKA (some kind of introduction event to new students) at my college. Actually i didn't know that we must attend it, but because we were invited, so some of us which was free at that time attend the event and have a chance to see the new students. Some of us gave some talks about the curriculum, the new credit system, and lots of other things that students must understand after they start studying in college. Getting to college is a time when they must enter a new environments with new culture, new friends, new method of studying, and many new things. It may not that easy to adapt for first year students, but we do hope they will survive. When Will Indonesia Use ODF? Last year, Malaysia has started to adopt ODF (Open Document Format) as their national standard on office application. This year, Indonesian Open Source Association is trying to push the Communication and Informatics Department to propose ODF as the Indonesian National Standards. This was reported by Engkos Koswara on "Second Asean Workshop on Open Source Software" event. Let's hope the plan is working well and next year, Indonesia will start using ODF as the standards on every office. By making it standards, it will accelerate the use of ODF on office and educational environments. It's open, reliable, standards, compatible, and many more. What else could you possible want with it? Florian Effenberger has announced the result of the OOo 3.0 Splash Screen contest. There are 798 voters on this contest (quite a big number for something that only happened for one week). The winner is Jacek Adamkiewicz: Proposal 3 which get 83 votes (not me). Don't assume that the next splash screen will be dominated by black color. Instead, the new splash screen gives you more color than 2.x splash screen. Congratulations to Jacek and please welcome the new splash screen for OOo 3.0 which will arrive in less than a month. Beautiful isn't it? Rapidshare give another option to their customers about their RapidPoint. RapidPoint can be used to create a new account or extend your current account by one month, add more quota to your account, and now, it can be used to get the rewards provided by RapidPoint program. You can buy special items ranging from small scale like iTunes or Amazon voucher, USB FlexLight, up to Giant R/C Mario Kart Racer, Anti-Gravity Globe, RC-9, and many more. These items were mostly cool, but they are very costly too. The smallest point needed is around 30000 points and you will only get 15 EUR of voucher for iTunes and Amazon.com. The highest one will cost you 500000 points, but it's not yet available yet. Please choose well, as you can only exchange one item per account. 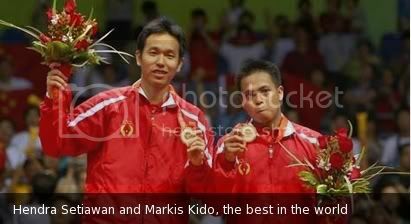 Finally, the Indonesian national flag was raised in Beijing through Markis Kido and Hendra Setiawan, after their huge effort of defeating Cai Yun and Fu Haifeng of China in the Badminton Men's Double final on August 16. I watched their match when i was having dinner with my girlfriend. Coming as the no. 1 rank in the world, their effort to grab a gold medal wasn't easy. But in the end, they still hold the tradition of goal medal from badminton. No wonder the official Olympic website said they are THE BEST IN THE WORLD. Too bad the Men's single were unable to retain their tradition on this year's Olympic game. Let's hope another medal will be given by the mixed double which will play today. This medal is also a wonderful present for Indonesian Independence day which is TODAY!!! Ever imagined that you could access your computer everywhere even though you don't bring your laptop with you? With eyeOS, you can make that dream come true. eyeOS is a web-based Desktop operating system, so everything you need is just a browser. No mandatory java nor flash plugin required, even though it could add some features when it exists. Other good thing is that you don't need to have database server. They use some kind of virtual file system to save your files and configuration. I tried this on my desktop which has Apache 2 as the web server and the installation takes less than 1 minute. All i did was just extract, give permission, and run the installer (via browser). It's like having a real operating system (except that you might not get a cool window manager just like GNOME or KDE). The developer has tried hard to make the application mimics the real desktop found on major operating system. The problem i encountered while playing with this is the resolution. I used 1024x768, but at some cases, this is not enough to display all the window, so i had to use the tab key to move to the bottom of the window and press the button. Perhaps raising to higher resolution will fix this problem. Even though it can be used for public access, i wouldn't use it. It's too risky to do that, especially some features requires 777 permission (you must set the permission to 777 at the beginning and the installer will take care of the rest). Anyways, it's a good application . I forgot to mention. It's also open source project. For those who missed the opening ceremonial of 2008 Beijing Olympic game, you can watch the full coverage of the fantastic opening by downloading from this link (RS). It contains the list of file you should download (also from RS). I'd rather not to display all the links here as it will be very long and boring. It's being split into 25 parts, with each part is approximately 90 MB, so the total is around 2,2 GB. You can join those parts with HJSplit or any other splitter which can join .001, .002 files. Google has updated their Calendar application to include more languages, including Indonesian (according to GMail Blog). Right now, they are chasing to support 50 languages (they are up to 38 currently). Let's hope their hopes come true (giving everyone the information they want in their native language). That's a good news, as i'm starting to use Google Calendar on my lecturer site. It listed all of my activities at work so students can see whether i'm busy or not on particular day. Linux kernel is one of the biggest open source project. It has more than nine millions line of codes with more than 1000 developers are working distributed around the world. For some people, joining this massive groups would require lots of guts, but Jonathan Corbet, LWN editor has make it easier by making a documentation about How to Participate in Linux Community (Linux kernel in this case). It gives you detailed about what the project are, how the process works, early planning and up to the phase when you will work on your own and start sending your patches as a result of your contribution to the project. Today Microsoft released 11 patches, with 6 of them are marked as critical, while the rest are marked important. The affected application are Microsoft Office and Windows (with lots of components inside it). Go get the list of updates here. OpenOffice.org 3.0 will be released in September (planned) and it will have a new splash screen, as always like what we had also in OpenOffice.org 2.0 release. As it's build by the community, the community deserves to vote for the final splash screen being used on the application. Here's how to do that. You look at the proposals being sent here. When you have done looking, open this URL to register your name and email address. You will get a confirmation email shortly and when you have, click on the URL given and you can start voting on your favorite splash screen. Voting will end on Monday, August 18th, 2008 at 12:00 UTC+1 (06:00 AM Indonesian Western Time). Please vote wisely, as changing your vote afterward is not possible! I have three candidates for it, but i have to pick one, so what must i say. I must choose the best among those three candidates. Long wait is finally over. UTorrent 1.8 has become final and released today. The main major feature added is Teredo and IPv6 support, but there's a slew of smaller features, changes and improvements. The changelog is absolutely massive, so check it on their announcement page. It has new icon, but most of the UI is still the same with 1.6. But it's still one of the smallest bittorrent client ever existed. That's why i loved it when i was playing in Windows. papers discussing promising experimental work. For those who missed the opening ceremonial, you can watch them at YouTube, even though it may not cover all of the show being demonstrated yesterday. At least you can see the torch being flamed on and also some dance and artistic performance by almost 15000 people. I am watching the best opening ceremonial of all Olympic being held in this world right now. It's not over yet, as there are more than 200 countries which participated in this big event which was held in 08-08-2008. The opening ceremonial was phenomenon. It combines culture, technology, and art together to present a fantastic visual effects and performance from more than 15000 people who participated in the opening ceremonial. I never thought that it would be this kind of opening. It's very different compared to other Olympic event ever held. I'm quite sure that most people would agree that this will be the biggest Olympic ever held ever. * Updated PCRE to version 7.7. * Fixed overflow in memnstr(). * Fixed crash in imageloadfont when an invalid font is given. * Fixed open_basedir handling issue in the curl extension. * Fixed mbstring.func_overload set in .htaccess becomes global. Read the full Changelog for detailed changes. Whenever you have reached the maximum download volume of your premium account, you can now convert your RapidPoints to additional download traffic. Every point is worth 15 megabyte. The maximum amount of traffic which can be added to your account is displayed in your premium zone. The upgrading of the RapidShare infrastructure is in full progess. Due to the extent of the upgrade we are calculating to finish the job at the beginning of September. Thus, we have raised the daily premium download traffic from 4 gigabyte to 5 gigabyte. If you are non-unlimited Speedy users (personal, time-based, and professional), this will be a good news for you. Speedy gave unlimited access without reducing your quota or your time slots starting 8 PM until 8 AM. It will be totally free usage. Too bad, this good news won't be implemented in all cities in Indonesia. Only in Cilegon, Serang, Jakarta, Bogor, Tangerang, Bekasi, Depok, Karawang, Bogor and Purwakarta. Please check the rules here, as it is kinda tricky as you will have to login after 8 PM or you will be charged as normal rate. Also you must not be logged in more than 12 hours or you will be charged with normal rate again. It seems that not only ITB and Unpad who changed their website. UGM also changed their website, even though it's only their Computer Science faculty. It's far better than the old one, but it sends PDF files without being asked. I think it's very annoying and the admin should have this fixed ASAP. By the way, they changed the degree from MKom into M.Cs (Master of Computer Science). My friend who has just graduated already got this title, so will i (hopefully this year). A few weeks ago, I contacted you after we introduced MySpace IM. I thought I would touch base with you again because we have now added a connector to Skype! As a further bonus, we are trying out experimental support for voice calls to your Skype contacts. Since call quality is not yet perfect, we do not yet allow calls to phone numbers or "SkypeOut" buddies. You can, however, call any of your Skype friends who may not yet be on imo.im. If you want to try out a call, click on the "Skype Test Call" buddy, and select "Start Call" in the conversation window, which now appears next to the webcam function. A call window should pop up. Make sure that you allow imo.im to access your microphone, or your voice will not be heard. Our Skype and MySpace connectors are still in their early stages, so please inform us about any problems you encounter by clicking the "Send us Feedback" link at the bottom of the imo homepage. We thank you for your continued interest and support of imo, and we welcome any suggestions for improvements. So, i offered him the presentation about MS Project, and i will give talks about BaseCampHQ. It's an online collaboration tools which can be used for project management as well, but in different style. The idea behind BaseCamp is that we can access our schedule anywhere, anytime without having to install specific application (MS Project in this case). It's a web-based application, so all you need is just a web browser. It's very easy to use, even for people who haven't tried this application before. In less than a 2 hours, i'm sure you will be able to use this tools by yourself. The presentation is now finished. Probably i will add more things tomorrow, but let's see about that. The final version is expected to be released between mid September and mid October of 2008. Make sure you download the updated documentation (the latest one at the time i write this post is dated 1 August 2008). More updates will became available when the final version is getting near the release date. Most Linux users are familiar with ssh. They used it frequently to do remote login to other machines in which they have access. The problem with the default ssh configuration is that you must type your password everytime you wanted to login. It can be counted as a good security measures, but in the other hand, sometimes it's annoying to write the same password everytime. Would it be a good idea if we can automate remote login? Some people (including this guy) sometimes have a problem with the blogging tool provided by the blogging services. They opted to pick third party tools which can help them do better blogging, mostly in posting. Well, SmashingMagazine has wrote an article about 15 Desktop Blogging Tools Reviewed which list some of the tools out there. Please note that this is only a review and it's not a perfect guidelines for everybody. The final decision is in your hand. I just came back from Amplaz after watching Mummy 3: Tomb of the Dragon Emperor. This is the third sequel of the Mummy series where Rick O'Connell and Evelyn O’Connell along with Jonathan Carnahan took another journey "raising" another mummy . Even though it should be released on 6 August (according to IMDB), it is already released in Indonesia. I didn't expect that it would be released today, as i checked the website this morning and i didn't find any information about it (i checked around 6 AM). My friend told me that the movie was played (that was around 8 AM) and i re-checked and yes, it's on.